Today is the official beginning of winter and so it seems appropriate that we started the week with a little of the white stuff. It made for some interesting pictures of the new bunkers. The fescue bullnose faces are so vertical that snow was unable to come to rest on them which left ribbons of green throughout the white landscape. Building bunkers in these conditions is difficult. Considering the weather and the upcoming holiday season, we are taking a break from construction. Another complication is that our sod is coming from the east side of the state. The east side of Washington is a high desert climate so it is really cold over there right now. So cold that the ground is frozen and they are unable to cut sod. We knew this time would come but we really thought it would come sooner. We did not expect to get so many bunkers built before the freeze. 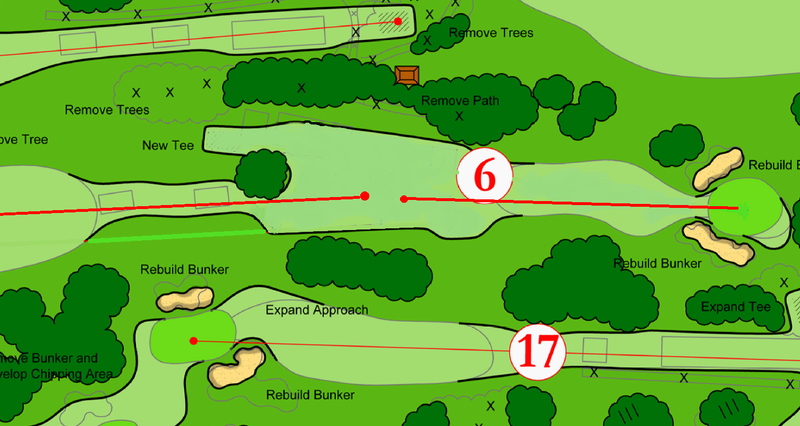 To date we have built 23 bunkers and filled in 8. We are exactly halfway done with the project so this is a perfect time for an intermission before we get back at it and finish this thing. Since I don't have new bunkers to show you, I'll take this opportunity to discuss some other aspects of the project. Specifically, I want to show you the unique features of what will be the new 6th and 18th teeing ground. This diagram shows how the new mowing pattern will include all the tees of the two holes into one area. Notice the words "new tee". Both holes get added length and yes, if two groups are hitting from the black tees at the same time, one will probably wait for the other since they'll be hitting almost directly over each other. There isn't too many rounds played from the black tees so this potentially awkward situation won't happen very often. Most of the rounds played at Tacoma are from the blue tees, and this diagram shows how during a normal setup, there is no safety issue and some groups might choose to hit at the same time, but I expect here too folks will wait for one group to play first, or maybe just alternate between individuals of both groups. It's going to be interesting to see what people do. What I love about this new combined teeing ground is the options for playing the two holes which adds almost an infinite amount of variety. For example some days you'll walk up to this configuration. What I love about this is that this is the way these two holes where played before the rerouting in 1989. In other words, this is the way these two holes were played for 83 years. This is going to be fun. This is also going to be fun. We can set it up like you see here which is a combination of the old 6th hole and the new 18th hole. A very unique situation is created here where people will be teeing off right next to one another. I just love this. Now of course to create this teeing ground, we had to remove a planting of ornamental shrubs that separated these two tees. Ironically, I myself built this planting as the Assistant Superintendent in 1994. That's really kind of weird that I've been here long enough to start changing things I already changed. Anyway, this is such a great idea, I wonder why we just didn't do this back in 1994. Let's look at some pictures I took of the area today. This is the new flat area of the teeway that will be the black tee for the 18th hole. From here she plays about 560 yards. Here I'm standing on what will be the new black tee for the 6th hole. She plays about 195 from here. Here is the shot from the original routing which is playing down today's 18th hole from today's 6th tee. Whats really interesting here is that curbing in the right side of the photo. Notice how it points down the 18th fairway. Yes, that is the same curbing that was there when the hole did play down that fairway. Nobody since then, including myself has bothered to replace, or relocate that curbing. Well I can tell you when this new combined tee is grown in, the plan is not just to remove the curbing you see there, but the entire cart path system. Here's a spot that is right in the middle of the two blue tees. It was recently part of an ornamental planting bed, but soon will be flattened out to be teeing ground. I'm guessing no one has ever really hit to the 6th green from this area, but I'm certain we will in the near future. It's a great angle to this green. A little further up is an area that will be a new angle from the white tees. Again, I don't think at any time in club history was this hole ever played from this area. Now, I'm not sure what you're thinking about all this, but personally I think this new combined teeing ground might be one of the greatest teeing grounds you ever play. Unbelievable variety can be created, especially for the 6th hole. In fact, considering how often the flag position changes, it could be that you never play the 6th hole from the same yardage and angle more than one time for the rest of your life. If you don't think that's pretty neat, then you just don't know good golf.